What is KM? I had this question when I first encountered the postgraduate program offerred by PolyU called Master of Science in Knowledge Management (MScKM). I have studied from kindergarden to university and have acquired substantial work experience after graduated from university. What can I do to manage my knowledge? How can I make the best use of the knowledge gained? These questions have always come to my mind. At that time I think that KM is like organising books in the book shelf. That is to gather the books I have and then put them in the shelf according to the ways I like. “Is this refers to knowledge management ?” I asked myself. To find out the answers to my questions, I enrolled for the MScKM Program in 2010. At the program I established interest in KM and made many new friends. I enjoyed the lectures and the opportunities to do challenging projects with big corporation and government department. I learnt from dedicated professors and subject matter experts on KM concepts, methods, best practices,…etc. The program has not only enriched my horizon by connecting with KM experts. Its rich content has also widened my work scope by helping organizations to learn using KM. The exposure of adopting technology during the program has indeed strengthend my technical capability to improve in personal effectiveness. Can we call ourselves KM professionals? How can we apply KM? Our KM classmates always talked about these questions at the time we met after we graduated in 2012. 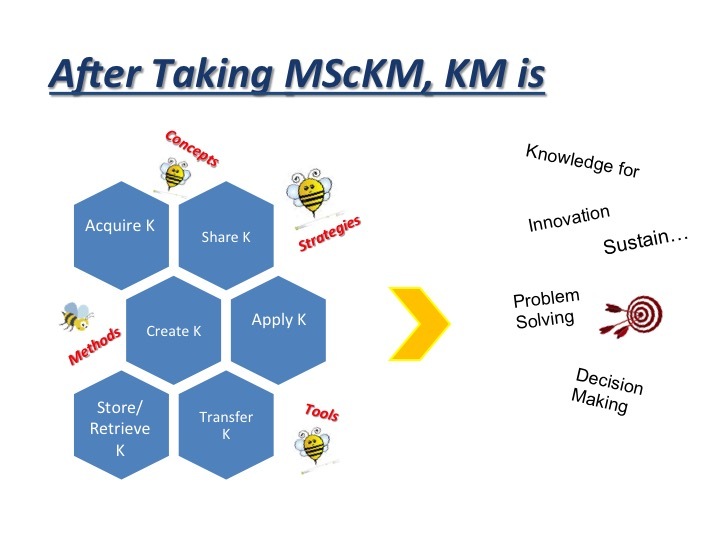 After completing MScKM and promoted KM at work, I have a different answer to the question “What is KM?”. The term “Knowledge” is generic that refers to the concepts, theories, strategies, methods, tools, skills, experience,…etc. The KM process includes the steps to acquire Knowledge, store and retrieve Knowledge, share and transfer Knowledge, apply Knowledege, create Knowledge and re-use Knowledge. 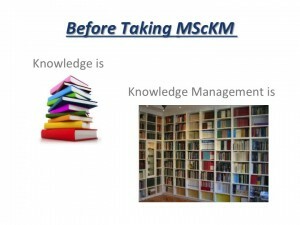 The study of KM is to acquire the “Knowledge” in each and every step of the KM process. It is aimed to facilitate the flow of Knowledge, to optimize the use of Knowledge and enhance the creation of new Knowledge. The ultimate goal is to add value to the Knowledge we possess. The Knowledge gained will help us formulate solutions to solve problems, develop wisdom to make better decision, and generate innovation to enhance the growth of individuals, organizations, communities …etc. This is very important and essential for us to survive and sustain under the globally volatile knowledge economy. Completing the MScKM Program is just the beginning of my KM journey. Hope I will be able to get new and better understanding of “What is KM” as time goes.